It’s that time of year again. Final sales numbers are in, and we can accurately reflect on where we’ve been and where the market may be headed in 2010. Each year we release the most comprehensive statistical report on SW Florida residential real estate, and this year’s report uncovers some interesting observations. Last year we said we really need jobs and employment to fix housing and that is partially true. A bottom seemed to form even without jobs and housing as investors came in and competed with first time home buyers for the best bargains. Never before have sale prices been so low as compared to rents as to cash flow for investors like we’re seeing now. This investor boom is much healthier now than back in 2005 as investors are helping to clear the foreclosure inventory, clean up the neighborhoods, and provide stability and capital until employment returns to the local economy. The underlying investment makes sense at today’s numbers, and in fact still has some room for price gains going forward as well. We also talked about the true test of a bottom last year. “Sales volume increases, inventory levels stabilize, and prices stabilize.” 2008 saw 2 out of 3 so we speculated that 2009 might bring all 3 into alignment, and this is what occurred. 2009 saw all 3 factors come together and in fact median home prices really firmed up the 2nd half of 2009. Sales in 2010 were up 92.11%, month’s supply of inventory fell from 17.53 months last year to 7.11 months this year, and both the median price and mean average sale price for single family homes rose in the 2nd half of 2009. All 3 signs point to a bottom that was reached in 2009. Is every bottom firm? Just look around and you’ll see the answer is no, but we think the real estate bottom should be, as investors seem to have set the floor by scooping up everything they can because it makes financial sense. The phrase financial sense is a far cry from the speculators we saw in 2005. So let’s give out some interesting facts from this year’s data: Last year we reported 9,207 sales. This year we report 10,021 sales that sold at $100,000 or less alone, and 4,651 sold from $100-$200k. 8,051 homes sold at or above full price last year. That’s almost as many homes as sold in all of 2008. Anyone who bought or tried to buy real estate in SW Florida last year knows this, as offers on properties were fast and furious. That equates to over 45% of the homes selling at full price or better. So how did the county do on prices? We’re down in price, but most of those declines were 1st half of the year vs. 1st half of 2008 numbers. Much of the declines were year over year, and we believe prices could start showing gains year over year in 2010. 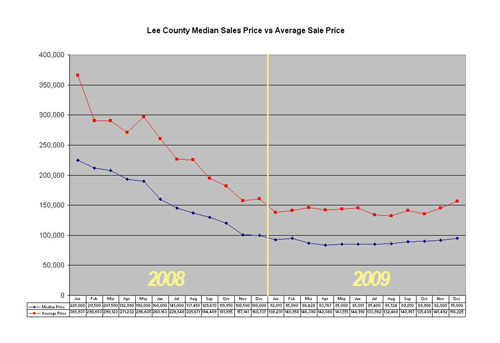 Countywide we’re reporting median prices down 38.82% and average price down 40.23% This won’t make sellers happy, or government that relies on taxes to pay for services, but government better get ready for less very soon, because when the Lee County property appraiser comes out with their numbers later this year, it won’t be a gain. So which area of the county fared the best? Our data shows Sanibel/Captiva fared the best, with a 18.51% price drop in media price and 19.45% drop in average price. Sales were up 28.97% last year in Sanibel/Captiva. The headlines will read market is down close to 40% in price, but that’s not the real story here. That was year over year data, and is primarily affected by 1st half sales. 2nd half of the year sales firmed up in price, and going forward there’s an excellent chance we’ll see some price gains year over year. It really depends on future foreclosure activity, jobs, and the economy. So don’t get hung up on the -40%. Look at the trend of prices for all of 2009 and we think the data speaks for itself. We’ll post a price graph from the report illustrating 2008-2009. Download your free copy of the State of the Market Report. You can look up all parts of the county, as we know, all real estate is local. This is just a snippet of data contained in the report. Posted in Southwest Florida Real Estate.Tagged Bonita Springs, Cape Coral, Estero real estate, Fort Myers, Fort Myers Beach.